Afternoon departure from various US airports by Icelandair via Iceland to Munich on an overnight flight. Departures from: Baltimore, Boston, Detroit, Tampa, Toronto, Montreal, Chicago, Denver, Minneapolis, Newark, Orlando, Seattle, Washington, D.C., and Dallas Airports for your nonstop/overnight flight via Keflavik Airport by Icelandair, WOW Airlines, American Airlines, Air Canada, or Delta Airlines. Arrive in Munich at noon. Transfer to traditional 4-star Hotel Platzl, located in the heart of the city, – next door to famous Hofbräuhaus and 980ft to Marienplatz where the Christkindlmarkt takes place. Rest before „Welcome to Germany“ dinner at Hofbräuhaus, „The World‘s most famous Tavern“ – built in 1589 and accommodates up to 5,000 revelers. Enjoy the beer and the crisp roast of Bavarian suckling pig.“ Have fun! Gudrun Erla Gisladottir, the expert quilt designer, has her business in Minnesota. She is originally from Iceland and has lead several successful groups from the United States to Iceland and other European countries. You will find Gudrun efficient, well organized and a fun girl to travel with. 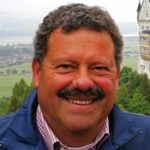 Maximilian Bukszpan is the Bavarian expert tour guide who will meet the group on arrival in Munich and stay with the group until you leave Munich for Iceland. “Max” is a native “Münchner” who has traveled the world. 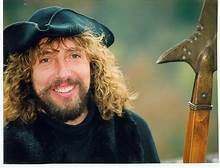 For the last 20 years he has offered his services as private tour guide throughout Bavaria, – including Munich, Rothenburg and Nuremberg. Morning tour of Munich with Maximilian Bukszpan, your expert Munich guide. 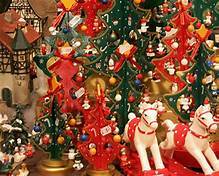 Visit some of the best holiday markets across the city and soak up the holiday spirit. The afternoon is yours at the Christkindlmarkt on Marienplatz. Shop for handmade Bavarian gifts, sip Glühwein, and try Lebkuchen, the gingerbread cookies, a treat since the 14th century. The traditional Christmas Market at Marienplatz dates back to the 14th century and is considered the most original and authentic in Munich, where about 40 such markets take place annually. The romantic setting in front of the neo-Gothic town hall adds to the magic of the many stalls radiating traditional Bavarian charm. Living tradition and ancient craftmanship are firmly established here, as is Germany’s largest “Kripperlmarkt” (“Manger Market”). Everything imaginable to create a nativity scene is available, from manger lanterns to gifts of the Three Magi. Other of the better-known Munich Christmas markets is the Viktualienmarkt which offers a vivid experience of Munich’s way of life. The Christmas Market at the Chinesischer Turm is particularly popular. Seasonal melodies played by a wind ensemble in the tower sound from the Chinesischer Turm, while horse-drawn carriages make their rounds. At the stalls, there are lamb-wool slippers, hand-made dolls and wooden angels waiting to be bought by visitors, who can otherwise enjoy gastronomical delights. 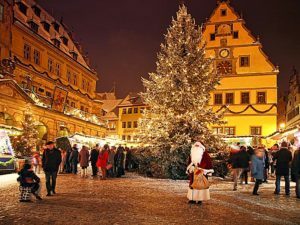 Then there is the Medieval Christmas Market, where merchants in historic costumes sell their wares … Max will know where to take you, so your limited time is well spent. Proceed from Munich along the Romantic Road for further adventures. Stop at pristine Harburg Castle, which has never been conquered, and visit quaint Dinkelsbühl, a medieval walled city with fascinating architecture. Afternoon arrival in famous Rothenburg. Check in at Hotel GoldenerHirsch, built in 1479 and located in the heart of the medieval town. Walking tour with „The Nightwatchman.“ Dinner at Restaurant Glocke – one of the best in town. In the years before the dawn of the 20th century, the night watchman was responsible for the safety of the inhabitants of this walled, fortified city. His job was dangerous, as he had to guard the city at night like a policeman. The night watchman made his rounds from nine in the evening until three in the morning. He relied on the town hall clock to tell him when to sing his “Hour Song,” reminding the people who slumbered safe in their houses that he was still alive and taking care of them. There were six of these men patrolling Rothenberg up to the year 1920. You will follow Hans Georg Baumgartner on his entertaining and informative rounds through the darkness. You will follow him through alleyways and across dimly lit squares and enjoy the special mood of the town at night. Free day without a program in Rothenberg. 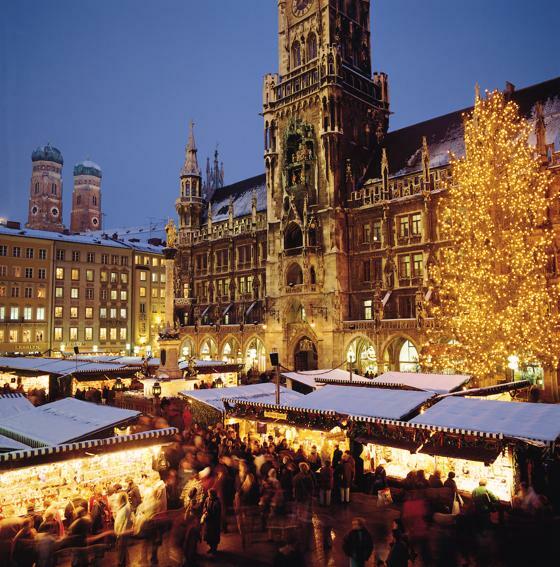 You will find the local Christkindlmarkt delightful and located within walking distance of your hotel. The smell of mulled wine and roasted almonds, the illumination by thousands of fairy lights and festive music by local brass bands all make for a pleasant Christmas spirit. 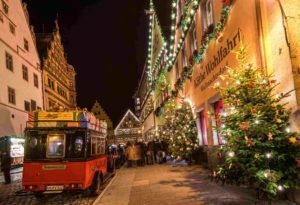 You will be enjoying an early Christmas in Bavaria and all the wonderful festivities that are described on these pages. It is a fact, however, that you will be traveling in the middle of winter, when mother nature may not always accommodate. The last thing that you wish for are long bus rides, having to change hotels every day, and having to face the elements at the same time. 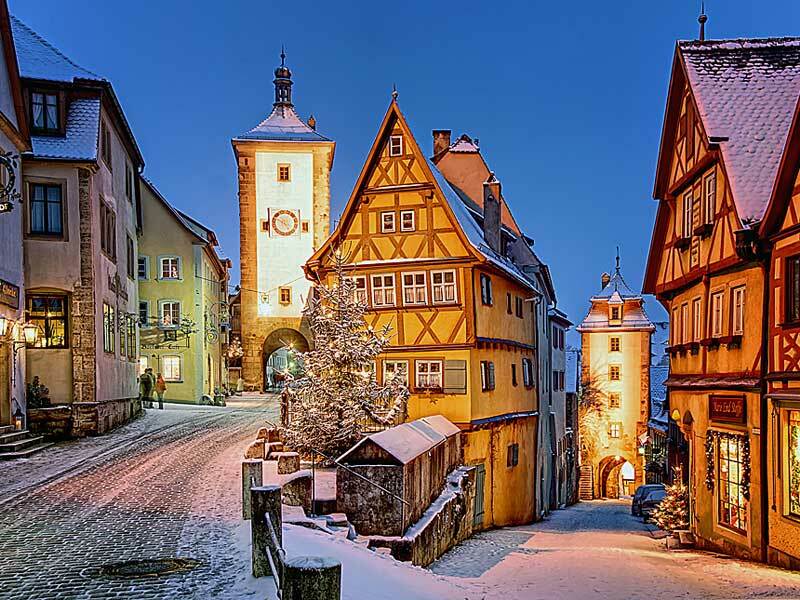 You will stay in a cozy hotel in Rothenberg for three nights; long enough to unpack, relax and take in the local flavors. Everything will be within walking distance; not only the local Christmas market. The day is free, and you may decide to take off on your own to explore this lovely city, by many described as the most beautiful in Germany. 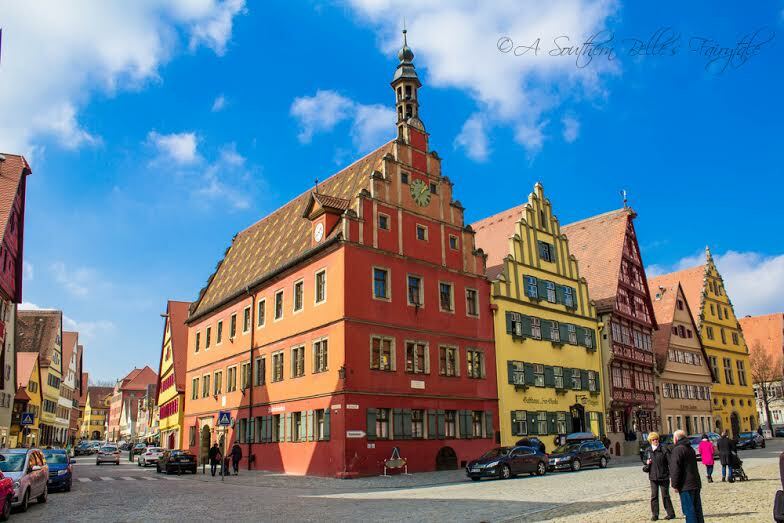 Quilters may join Gudrun in the morning to visit “Der Patchwork Engel,” a local quilt store, while others will join Maximilian on a walking tour of medieval Rothenberg in the afternoon. A quilting workshop will be offered in the late afternoon. If the weather doesn’t cooperate, there are several museums to consider; a wonderful Christmas Museum, the Dolls and Toy Museum, and the Medieval Crime Museum (perfect for the men in the group! ), with over 1000 years of crime and punishment in Europe on display. Spend the day in Nuremberg. 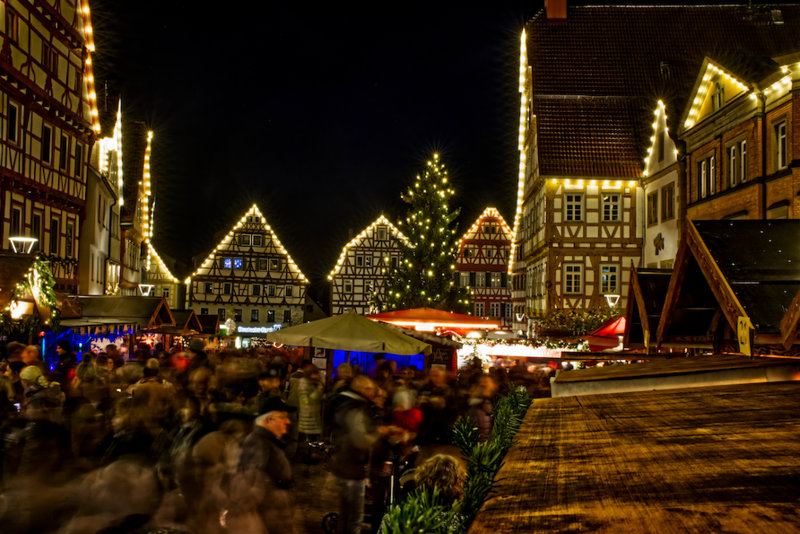 Visit the world famous Christkindlmarkt which takes place in the Hauptmarkt, the Central Square in Nuremberg´s old town. It will be a very special day. With about two million visitors a year the Nürnberger Christkindlmarkt is one of the largest Christmas markets in Germany and one of the most famous in the world. Your tour guide Maximilian will be in charge. 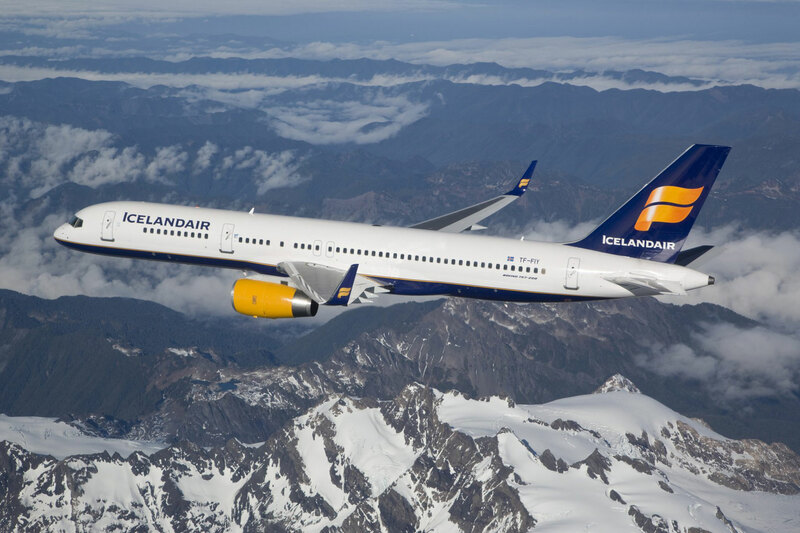 Proceed to Munich Airport and fly by Icelandair to Iceland´s Keflavik Airport. Afternoon arrival after a 4-hour direct flight. 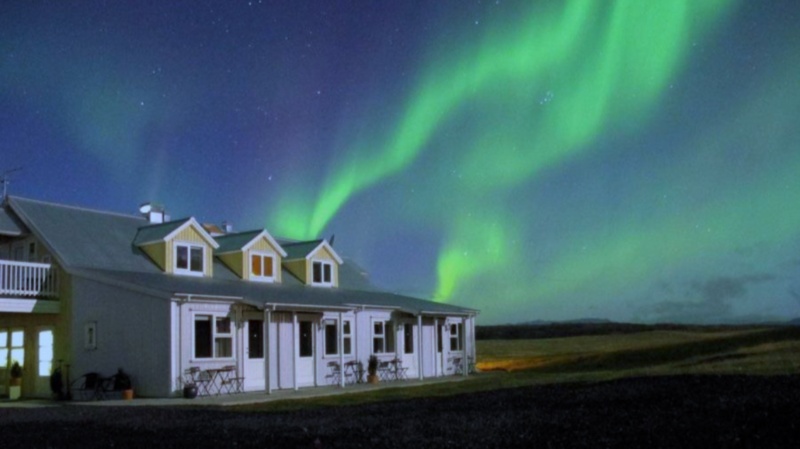 Drive 2 hours to Southern Iceland and arrive at cozy Hotel Lækur, located in the perfect place to observe the Northern Lights – away from all city lights. Welcome to Iceland Dinner. Days are short in Iceland this time of the year. It will be dark when you arrive at Hotel Laekur. With some luck and if the conditions allow you will see the spectacular Northern Lights. If not, you will enjoy a great dinner in a very special place, – a barn refashioned as a country hotel. When you depart from Munich you will say your by-byes to Maximilian. When you arrive in Iceland, Gudrun Erla will be in her home country and a local guide will not be needed. Drive to Geysir Geothermal area, where you will see any number of bubbling, spouting and boiling hot springs in eerie moonlike landscapes. Visit Geysir, the first geyser for which all geysers are named. See Strokkur geysir erupting every 4-8 minutes. 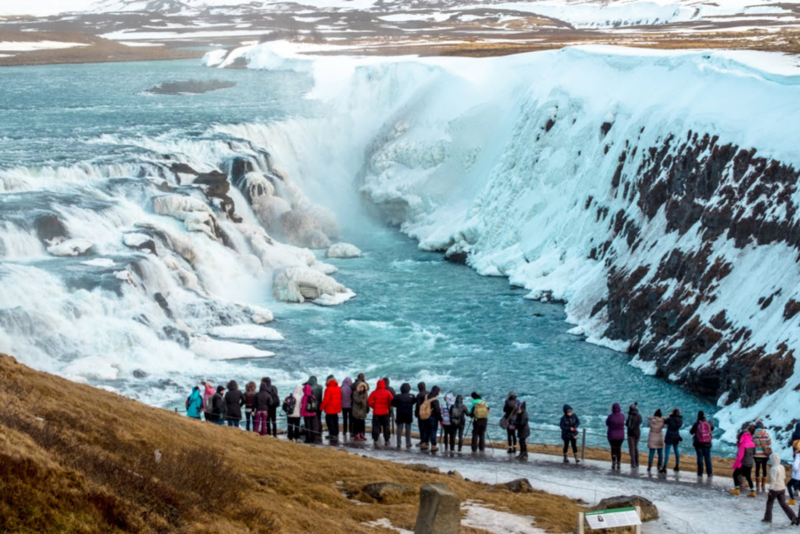 Drive on to nearby Gullfoss, the majestic waterfall, one of the world´s most scenic. Lunch at Friðheimar Farm an amazing greenhouse complex, followed by a horse show that provides an insight into the story of the remarkable Icelandic horse breed. 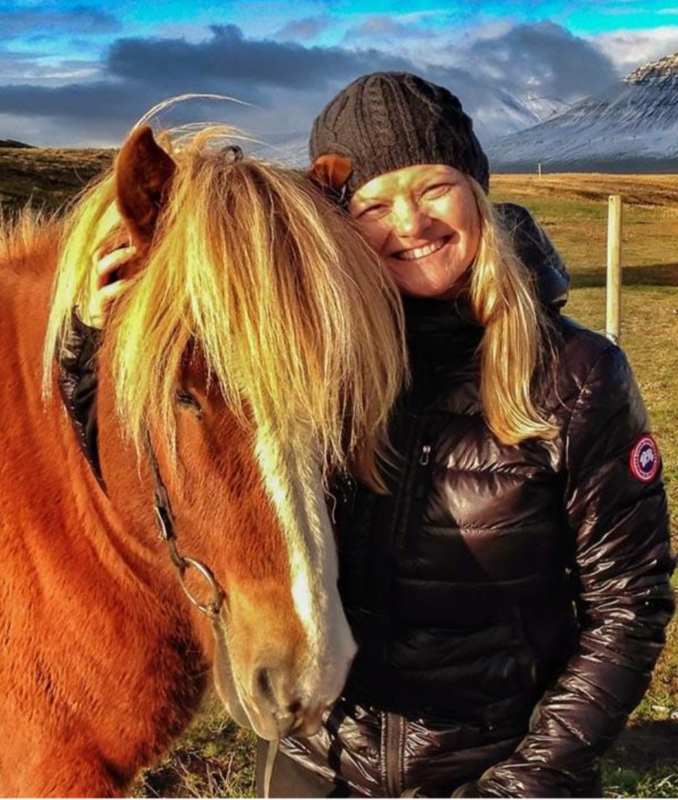 Enjoy a “Meeting with the Horses.” Continue to Selfoss and visit family and friends of your fearless leader Guðrún Erla. Drive on to Reykjavik and settle in at Hotel Arnarhvoll for a 2-night stay. Dinner at The Icelandic Bar. 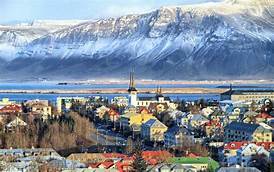 Tour Reykjavik in the morning and see all the major city attractions. The afternoon is free without a program. Reykjavik will be all decked out in Christmas lights and in full holiday spirit. 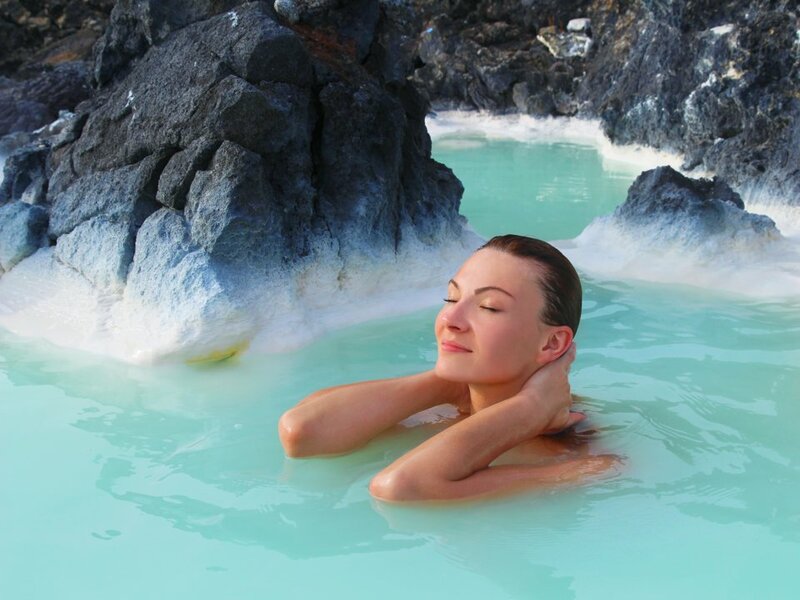 The morning is free in Reykjavik, – or, you can visit (optional) the famous Blue Lagoon for a 2-hour bath. Afternoon transfer to Keflavik Airport and departure to the various US destinations.